ExifDataView is a new utility that reads and displays the Exif data stored inside .jpg image files generated by digital cameras. The Exif data includes the name of the company created the camera, camera model, the date/time that the photograph was taken, Exposure Time, ISO Speed, GPS information (for digital cameras with GPS), and more. The main window of ExifDataView displays 2 panes. 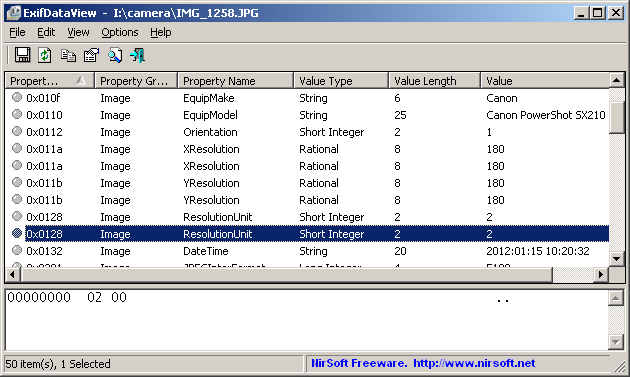 The upper pane shows the list of all Exif properties found in the opened .jpg file. When selecting a single property in the upper pane, the lower pane displays the selected property as Hex Dump. Posted by NirSoft on April 6, 2012 at 12:54 pm under Utilities Update.